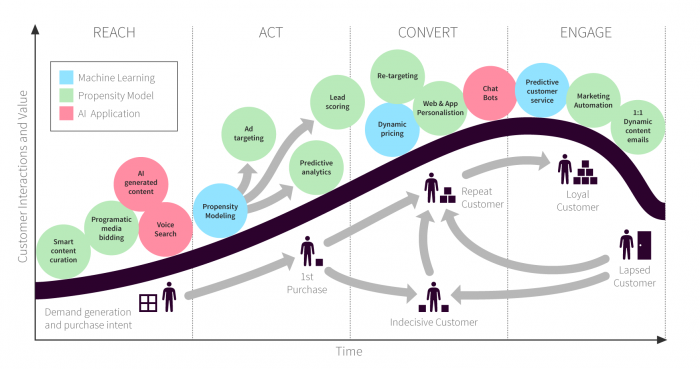 Let’s reflect a bit on the so-called AI revolution in marketing. Companies are sitting on an almost endless amount of customer data. This data needs to be analyzed, cleaned up, sorted through, questioned and leveraged. This can all be done by AI. Which questions do you want to be answered by AI-related methods and tools? With GDPR impacting Marketing, data is at the forefront. While these changes make businesses accountable for their data, how they manage that data can ultimately lead to even more siloed, disconnected operations. As a consequence, marketers need to take control of their data. The first step is for marketers is to make sure that they have true ownership of their own data resources. For instance, are you the owner of your data generated on social media? This means taking stock of their entire marketing ecosystem, ensuring the right teams have the right access to the right data and streamlining resources where appropriate to help break down silos. Before you can change how a team processes information, you have to ensure that all the players have access to, and are reading from, the same playbook. At this moment, you need a strong data governance to optimize the entire data + AI process. There is a lot of interesting work on the algorithm side, but as a technologist, I often see people underestimating the work-flow integration. It’s really important to understand how marketers work, and it is great if your company has a cloud-based software on a browser, so you can actually track how people use your software and make it better for them. The goal is to make sure that the information created will benefit your teams. In order to achieve this, you need an easy-to-use interface that can deliver the right information to your marketing team. Are you ready for an AI solution? This comes as the number one reason for the failure of marketing analytics. Data is only good as the analyzer and therefore interpretation of data is of vital importance. Misinterpretation of facts, lackluster notes and insights can lead to error in decision-making ruining the whole process in a marketing strategy. The vast majority of data fails to meet the basic standards needed to properly train a predictive model (ML). The quality demands of machine learning are steep, and bad data can impact the entire process— first in the historical data used to train the predictive model and second in the new data used by that model to make future decisions. To compensate, data scientists cleanse the data before training the predictive model. It is time-consuming, tedious work,and it’s the problem data scientists complain about most. This central repository could be a structured environment such as a marketing database; it could also be done in an unstructured environment such as a data lake. Many organizations are starting to stand up data lakes to enable the capture of unstructured data, such as social media posts or call center transcripts. The data lake allows for future data types to be added easily, which then can be accessed by AI tools as they are introduced into the martech stack over time. An aspect of AI technologies that is often overlooked, is that AI requires good data to perform effectively. Artificial intelligence and data are being put to good use in marketing in a number of different ways. The use case that is the most familiar to people is recommendations. From product recommendations on Amazon, to movie recommendations on Netflix, these are all being driven by AI algorithms. My personal opinion is that , analytics-focused practitioners, should be thinking of HIAI–Human Intelligence, Artificial Intelligence–as a hybrid approach. Prediction algorithms that form a lot of the AI tools that can be used for marketing analytics and customer insights are engineered to work well. Eventually, if you work hard enough you’ll get a pretty great prediction model out of machine learning and AI. But let’s not forget about the humans! I think there’s great potential in taking an HIAI approach in marketing analytics. Indeed, there’s a lot of human knowledge–learned over time through experience that we cannot just ignore. 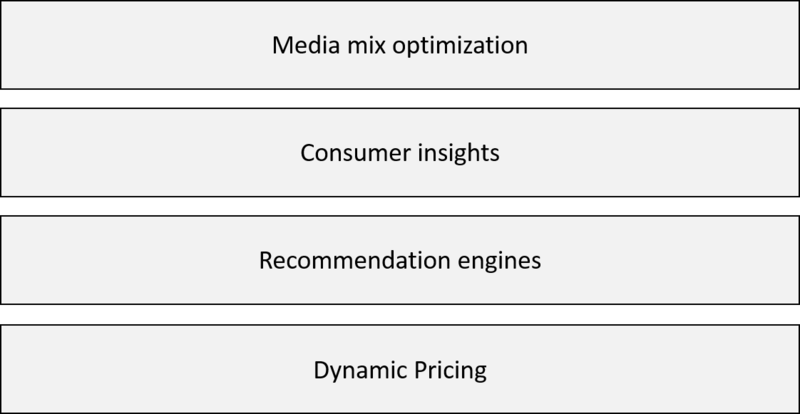 A common issue that marketers face in data-driven advertising is that there is an overwhelming number of data sources, analytics packages and marketing software services with noisy data that can be hard to classify without the proper technology to analyze these. Companies are seeking to integrate insights across all these tools in a way that is less time-consuming and costs less overhead than current solutions. One way of solving this issue is by using AI-powered analytics to gather the outputs from all these tools, platforms and datasets to help determine new patterns that can aid future decisions. By analyzing analytics, businesses can use AI to identify a more integrated idea of how this data is relevant to consumers, making it easier to know what the best marketing techniques are, as well as what platforms these techniques should be rolled out to. These massive data sets required can be difficult to obtain or create for many companies, and labeling remains a challenge. Most current AI models are trained through “supervised learning”, which requires humans to label and categorize the underlying data. Supervised learning:the machine learning task of learning a function that maps an input to an output based on example input-output pairs. It infers a function from labeled training data consisting of a set of training examples. However promising new techniques are emerging to overcome these data bottlenecks, such as reinforcement learning, generative adversarial networks, transfer learning, and “one-shot learning,” which allows a trained AI model to learn about a subject based on a small number of real-world demonstrations or examples — and sometimes just one. Having the right data governance, data quality and data infrastucture are really important before considering an AI solution.